We hope that this Panorama II will be as successful as the previous Panorama I. We dedicate this work to the State of Kuwait, in recognition of its virtues. 1. 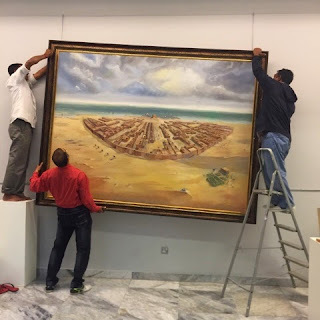 Britain: In 2015, the painting participated in one of the documentary films of British Airways in their narration about the State of Kuwait. The Documentary film: Kuwait through Our Eyes by Lawrence J. Ireton. The film was displayedduring British flights around the world and the painting is shown during the film at minute 2:45. 2. India: 2017, the painting took place in a documentary film on economic life in Kuwait - in the Indian channel Planet Telugu, in Hindi. The painting is displayed at second 19. The painting was also included in the curriculums of the Ministry of Education in the State of Kuwait - kindergarten 2 within teaching of the forms of national symbols of the State of Kuwait. 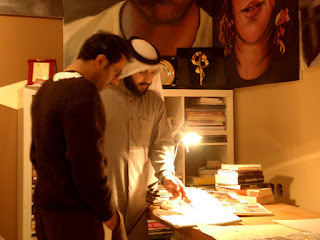 11 years ago, after a discussion between the researcher and the artist regarding creating an artistic documentary painting depicting the architectural shape of Kuwait in the era of the First Wall “Soor I”. 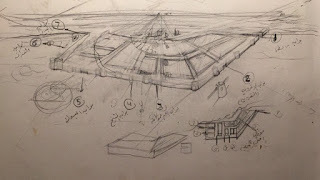 The discussion resulted increating Kuwait Panorama I, which was published in 2007, and it was very successfuland prosperous in both scientific and media fields, locally in Kuwait and internationally inBritain, India, America and the Middle East. Therefore, Kuwait Panorama II (of Second Wall) is an extension of Kuwait Panorama I (of First Wall). The first panorama represents the emergence of Kuwait first village with the first wall, by studying the first architectural construction and the beginnings of the approximate shape of ancient Kuwait, as this historical artistic perception was expressedthrough this painting. 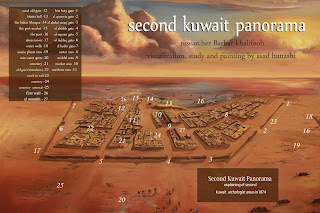 Therefore, this growth and expansion of this first village makes us see the emergence of the second city with the second wall, through the real expansion and growth, the shape of roads and their succession and the direction of the historical view of architectural planning, so we studied the Kuwait Panorama II (Kuwait 1874) which expresses this concept as the latest era of second wall, according to historical sources, (Lorimer and Dickson), as the second wall collapsed after this period and the country remained for many years without a wall until the construction of third wall in 1920. 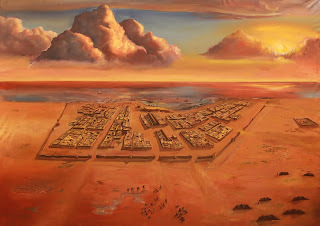 Kuwait Panorama I clarifies the urban nature of the population with its first wall and its first geographical origin. It is the first point that started from the coast and determined the city's coastline and its circularity. The second, it clarifies the shape and random layout resulting from that population. The inner neighborhoods looked more clear and limited through the urban gradient through years. This growth has had an impact on the modern features of the State in terms of geometric and urban form and modern architectural planning. In the comparison of the shape of city at the era of the First Wall “Soor I” (1760 - 1798) and the shape of city at the era of Second Wall “SoorII” of longer age, the city went through two stages at each stage it was characterized by various renovations and expansions from the period (1798 - 1812) and the period (1812 - 1874). 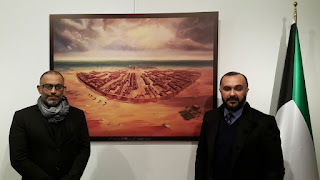 The comparison is made between both paintings of Kuwait Panorama I and Kuwait Panorama II and was documented to represent the shape of Kuwait at the end of the era of Second Wall “Soor II”. During the era of Second Wall “Soor II”, Kuwait was more explicit and wide, especially the expansion of the market area and the (Jibla). In general, the mosques in Kuwait Panorama I are 11 mosques. In contrast, the mosques number in Kuwait Panorama II is about 23 mosques, which is more than the double, according to time approximation in 1874, according to historical sources for the late period of the Second Wall “Soor II”, theevidence of the capacity and depth of the second city compared to the first city is evident. It is an architectural era where the second city was narrowed and filled with mosques. The mosqueswere built almost sequentially. There is no clear period of time between the mosques construction. This was an evidence of the expansion of city and its neighborhoods. The number of mosques has remained unchanged over a relatively long period of time. 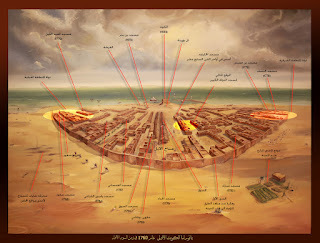 The situation remained the same until the mosque of al-Mutaba was constructed in the east and the mosque of Sa'id in the west (Jibla) in the period converged around the breadth of the two sides of the city concurrently outside the boundaries of the second wall between the eastern neighborhood and the (Jibla). 1 - Alforda area and Coastline: the front area located at the front of the coast city represented by the port site and coastal and marine activities. 2- Climate and Market area: the center of the city between the neighborhoods in the middle, which plays the role of the commercial area in terms ofthe market activity and reception of caravans. 3- The site of the wall with its towers and seven gates: Surrounding the city and reaching the last point of the city (security area), in addition to checking of entry and exit as the gates usually beclosed throughout the night and there is no entry or exit in this period. The three neighborhoods (Sharq - Center - Jibla) have expanded after that, especially Qibla and Sharq. 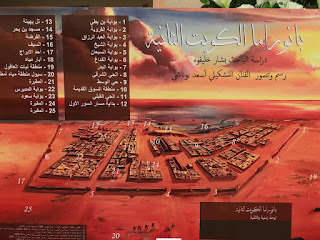 Many neighborhoods appeared between the borders of the second wall and the borders of the third wall, Al-Murqab is the most important and famous among them. Outside the wall is the vast desert “Badiyah” of Kuwait as well as the islands and rural areas of Kuwait. 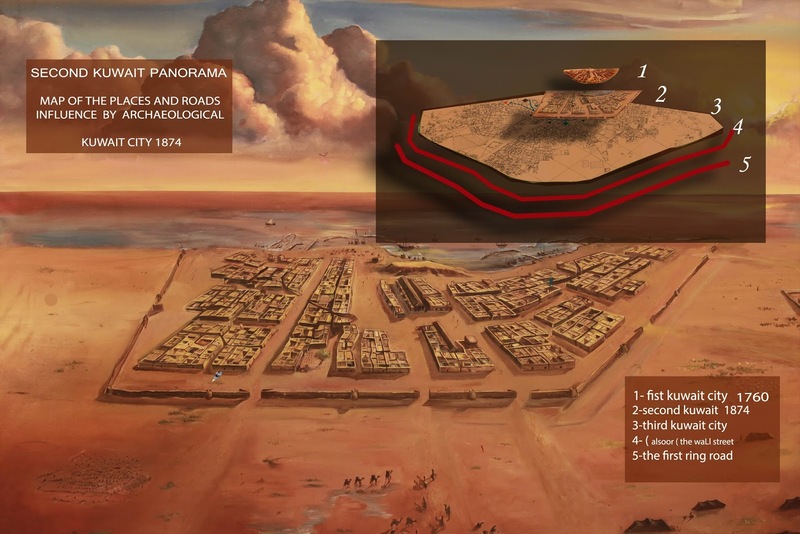 If we look at the real Kuwait or through the maps today, we will see that its layout is based on the form of a radius (half circle), this half circle is influenced by the circular capital, after which starts Al-Soor street and the first ring road with its circle wrapping around the capital where the ring roads are in sequence from the first ring road until the seventh ring road. Kuwait city (Capital) which is encircled by the wall of Kuwait built in 1920, was constructed on the shape of half circle by the wall which was wrapping around the city with its gates and towers, and which affected Al-Soor street after being displaced in the year 1957, which followedthe circularity of the wall “Soor” and affected the ring roads. 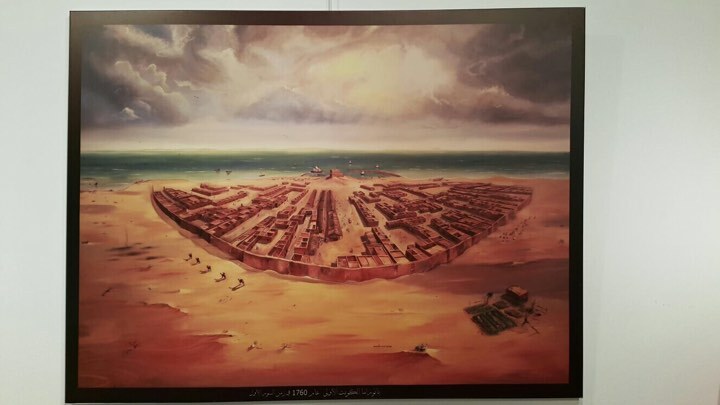 These ring roads were mostly inter-sectioned by straight roads, from the city borders (the wall of the third Soor – the current Soor St.) and were affected by an irregular random architecturalstructure located inside the city, which affected the alignment of these roads from the outside, formed and connected with all modern architectural city of all Kuwait towards all the governorates (provinces) with its suburbs and residential areas, all residential areas in Kuwait are connected to a straight or circular road which is connected with the architectural planning network linked with (Capital) Kuwait City with its coastal circularity. The construction of Kuwait City with the third wall “Soor III” (1920-1957) had a clear effect in the division of all Kuwait in our time in terms of architectural planning affected by ring or straightroads established in the city of Kuwait. 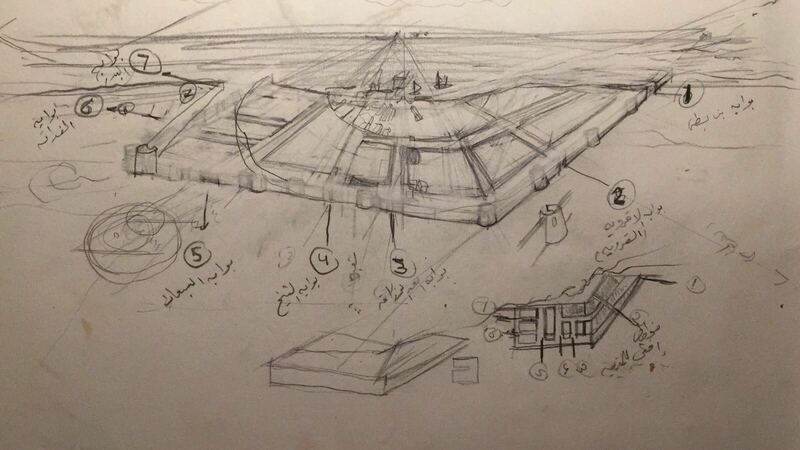 We conclude from the study of the history of architect in Kuwait City that the architect in the city of third wall “Soor III” (1920) has been made logically and randomly influenced by the architect of the city of second wall “Soor II” which inevitably was affected by the city of firstwall “Soor I”. Safat, had an active role in Kuwait third wall “Soor III” city, it was surrounded by graves during the second wall “Soor II” era, which did not include architect and became a large area for camels, until it became an effective crossroads and represents the center of the capital today, therefore the city of Second wall “Soor II” has affected the formation of Kuwait City (Capital) of the third wall constructed in 1920 as all architectural features refer to the same. If we compared the number of gates of the third wall with the number of gates of the second wall, it is clear that despite the difference in size between the two walls (Second wall is smaller compared to the third wall) but the second wall gates are distributed in a well-arranged order with 7 gates compared to the third wall with 5 gates. Therefore, the second wall with its seven gates, despite its small size, it gives architecturalindications of the precise division within the second city, seven gates mean seven roads inside and outside the wall, which affects the existence of roads linking these seven roads, which refers to the ring roads. There are roads linking the internal roads of the seven gates within the city. Their movement is reflected in the existence of seven roads outside the Second Wall. These seven external roads partially contributed to the architectural formation of the city of the Third Wall (1920), which gave a planning perceptionof straight roads from Al-Soor Street (the capital of Kuwait today). The architectural theory of the State of Kuwait is governed by a circular road and a straight road. Panorama Kuwait II is a study, imagination and vision, preceded by Panorama Kuwait I both implemented in scientific method, it is an artistic documentary work integrating information and artistic perceptions, where the integration is processed according to the geographical facts to adjust features and technical parameters in all its dimensions and comparative results, so this Panorama is a perception that simulates reality and is discussed as an art and history at the same time. This means that there is historical information within this Panorama that has been documented and there are technical perceptions made through technical and accountablemeasurement towards the earliest historical perspective. 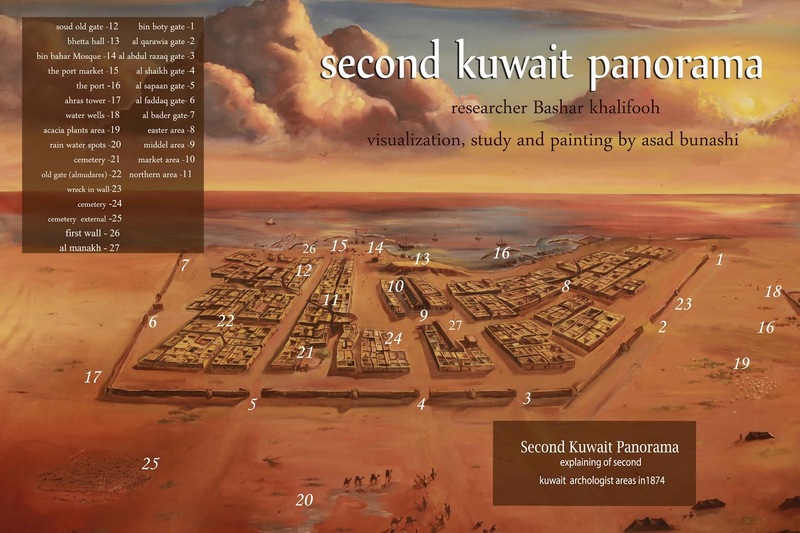 The sources that coincided with this period are scarce and almost non-existent in terms of the late nineteenth century at the end of the era of the second wall “Soor II”, the oldest synchronous source in that period on which this Panorama depends as an important reference, is what was published by the “Center for Research and Studies on Kuwait” for the map of the city during the era of the Second Wall, which dates back to 1867, published in (the letter of Kuwait) issued in the volume 28 published in the month of Shawwal 1430 AH corresponding to October 2009, a set of navigation maps published by the “Center for Research and Studies on Kuwait”, which reflects the navigation activity of rare maps of marine explorations work carried out by the Indian Royal Navy, and saved in the British National Archives Museum.